now reading: Why Was ISIS Successful? The following essay is adapted from 'Armies of Sand: The Past, Present, and Future of Arab Military Effectiveness' by Kenneth M. Pollack, now available from Oxford University Press. 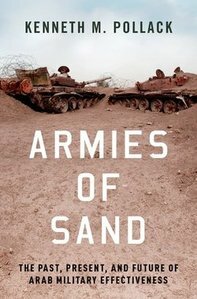 'Armies of Sand: The Past, Present, and Future of Arab Military Effectiveness' explains how the politics, economics, and culture of the modern Arab world has shaped the military power of the Arab states. Overwhelmingly, the impact has been negative, producing the vast tableaux of misfortune that has been Arab military history since 1945 and right up to the present day. It is why Arab armed forces have so consistently underperformed, losing most of their wars despite any number of favorable material factors. It is also why their victories have been rare and typically modest, if not outright Pyrrhic. Yet in June 2014, ISIS—or Da’ish as it is referred to in Arabic—stunned the world by overrunning most of northern and western Iraq, seizing the massive city of Mosul, and causing five divisions of the Iraqi army to collapse. Much of its success was a product of the weakness of the Iraqi armed forces. However, some of it derived from Da’ish’s own exceptional performance. Indeed, Da’ish and Hizballah are the two most important Arab non-state militaries that demonstrated a clear superiority in their battlefield competence over the vast majority of Arab militaries since the Second World War. Understanding why they were exceptionally more successful is therefore a critical element in understanding how Arab society has shaped its armed forces during the modern era, and how the Middle Eastern military balance may change in the future. Ultimately, there were a number of reasons why Da’ish did as well as it did in 2013-2015, and this excerpt explains the most important. Especially in the kind of amateurish militia combat that has characterized much of the fighting in the Middle East, merely being willing to keep fighting, killing, and dying is often a decisive advantage. “Its operational capabilities are not stellar, but the high level of its fighting spirit and the readiness with which its followers embrace self-sacrifice have allowed it to expand its control over the region,” in Siboni’s words. More than that, Da’ish fighters are often, but not always, willing not just to keep shooting at the other guy and absorbing losses, but to advance against fire. That is a very unusual trait in these kinds of wars, something that also gave Hizballah an advantage over other militias during the Lebanese Civil War. It is less that such an assault can result in taking an enemy position (which it certainly can) and more that doing so can be terrifying to troops who know that they would never be willing to do the same, which often causes the morale of less committed formations to crack. That is often the surest path to victory in these kinds of militia firefights. Again, like Hizballah, Da’ish has been able to rely on a reasonably competent cadre of commanders. And again, both at strategic/ operational and tactical levels, this has been uneven. Yet Da’ish’s victories, where they have come, have often been the product of some very smart strategy and/or able battlefield leadership. Moreover, Da’ish has proven itself to be a learning organization, a trait that has to come from its leadership, especially its senior-most leaders. Please understand that I am not denying that these men exist or that they did not make important contributions to Da’ish’s military fortunes, only that their role has been exaggerated and the reason that they have contributed has little to do with their service in Saddam’s army. There are tens of thousands of former Iraqi soldiers who fought with Da’ish, and before that with AQI. What is important about those who have become key leaders of Da’ish is that they were the ones who survived and thrived through the American occupation, the 2005–2008 Iraqi Civil War, the Surge, and then the Syrian Civil War. The vast majority didn’t. They got killed. They got injured. They got tired. They got sidelined. Unlike all of the rest, these 100–150 men figured out how to fight, how to stay alive, and how to succeed in this kind of warfare. That is why they advanced through Da’ish’s ranks and why they became important members of Da’ish’s command staff. They seem to have some degree of camaraderie as a result of this shared apprenticeship in Saddam’s army, and some no doubt learned some useful things there, but it was not their service in Saddam’s army that made them able military commanders. It is the fact that they had innate qualities that enabled them to get something out of service in the Iraqi army—which millions of other Iraqis who also served in the Iraqi army lacked and so got nothing from—that made them successful. In an army as large as Saddam’s was, with hundreds of thousands of troops and tens of thousands of officers, it is not surprising to find several hundred very good officers. And placed in the right circumstances, those very good officers can emerge, demonstrate their abilities, learn from experience, and become quite formidable strategists, planners, and field commanders. That is what happened with these men and what made them good commanders, not anything they got from Saddam’s army—which millions of others had passed through without benefit, either to Saddam or Da’ish. Finally, to the extent that they deserve credit for Da’ish’s greater effective- ness, their impact was probably greatest in the early days of Da’ish’s success. At that time the organization was smaller, allowing a relatively small group of competent leaders to have greater impact. They also had far greater freedom of action then. At first, none of their primary foes—the Iraqi government, the Syrian regime, the Kurds, the Iranians, the United States—took them seriously, and so they could do more with the limited resources at their disposal. Once they had shocked the world with their run of victories, they quickly lost those early advantages and their limitations became far more pronounced. You may have noticed that I used the phrase “placed in the right circumstances” in the last paragraph. That was not an offhand reference. It isn’t just that these competent officers succeeded in the Darwinian struggles of the Iraqi and Syrian civil wars, it is that Da’ish’s structure enabled them to emerge and then took advantage of their qualities in ways that other militaries (including Saddam’s) did not. This structure had both advantages and disadvantages. As Knights and Mello point out, it made it hard for Da’ish to coordinate large operations, especially attacks, and is part of the reason most of their attacks were clumsy, except in the perfect conditions of June 2014. However, they also required and relied on tactical commanders willing and able to think and act for themselves with little direction from higher authority. Hopefully, the link with Arab cultural patterns is becoming clear again. The point is that Da’ish is not a typical Arab hierarchy. It does not function like a typical hierarchic organization in the Arab world. As with Hizballah, many “culturally-regular” Arabs would have a very hard time relating to such a structure. Others, those who are not “culturally-regular,” who deviate significantly from the cultural mean, might thrive in such circumstances (people who probably felt smothered in traditional Arab organizations). Moreover, Da’ish as an organization is clearly led by such people, which is part of the reason their group has survived and become a major player in the Darwinian struggle across Iraq and Syria. They then seek out others like themselves, men who can think and act independently, and they put those men in positions of command because that is what they need for this organization to function properly. Da’ish’s leaders are clearly not culturally regular themselves. That has been a key element of their survival and success, and they deliberately seek out other, non-culturally-regular individuals for their organization, which requires such people for its continued success. Joining Da’ish is not a “normal” thing for any Arab to do. There are 300 million Arabs and, at most, only about 200,000 have been part of Da’ish in any way, and many of them were forced into it. The small minority of Arabs who join Da’ish are very unusual. They clearly represent a highly rebellious minority. It should not be surprising to find that (1) they have created a hierarchy that does not function like a traditional Arab hierarchy, (2) that the system selects for people who do not behave in culturally-regular ways, and (3) that the organization does not perform in culturally-regular ways on the battlefield. Indeed, there is an extensive body of sociological and psychological work demonstrating that Arabs who join terrorist and insurgent groups have “emerged mainly in milieus where the culture has been distorted or destroyed,” in Gary Gregg’s words. In other words, Da’ish takes Arabs who are not “normal” by the standards of Arab society and then places them in a hierarchy that is also not “normal” by those same standards. It should not be surprising then that the organization does not perform the way that “normal” Arab organizations perform, and since warfare is an area where the normal Arab organization performs badly, it should not be surprising that this abnormal organization performs better. A related piece of the puzzle is the high number of foreign fighters and how they have contributed to Da’ish’s success. Foreign fighters have clearly played a huge role in Da’ish, far more so than for any previous such group. Although the numbers are very soft, it may be that half or more of Da’ish fighters are from somewhere other than Iraq and Syria. For instance, in September 2014, the CIA estimated that Da’ish had 31,000 fighters al- together. Five months later, the chief of the US National Counterterrorism Center testified that 20,000 foreign fighters had gone to Iraq and Syria, most to fight with Da’ish. The foreign fighters are important for two reasons. First, many of the foreign fighters are fellow Arabs from outside Iraq and Syria. Again, they are not “normal.” One could make the case that for a young, unemployed, Sunni Iraqi or Syrian male, joining Da’ish in 2012–2015 made some sense: their communities were enmeshed in civil war, they had no reason not to fight, they could justify doing so to protect their family or community, and Da’ish was the coolest gang in town. It is a lot harder to make that case for a Saudi, Tunisian, Algerian, or Egyptian. Again, tens of thousands did, but hundreds of millions did not. And not surprisingly, those who did were not culturally regular. As a result, some made for competent military commanders, such as Abu Jandal al-Masri (Egyptian) and Abu Huzayfa al-Yamani (Yemeni). Others may not have demonstrated the same military competence, but brought tremendous zeal with them instead. Thus, the foreign fighters have been a critical element of the high morale that has been an important aspect of Da’ish’s success. Moreover, for many, zeal made them prime candidates to become suicide bombers, a very important role for Da’ish, but again something ut- terly abnormal for Arab society. Thus, by attracting large numbers of non- culturally regular people from across the Arab world, Da’ish has benefitted by having a larger pool of people with useful military skills, whether it be leadership abilities or a reckless devotion to the cause. One of the more interesting things about Da’ish is how many non-Arab Muslims it has attracted to its cause. This started with al-Qa’ida, but its offspring, Da’ish, really took it to unprecedented levels. These non-Arabs are important because they too show extraordinary commitment to the cause and because they do not evince any Arab cultural predilections. Talk about not being culturally-regular Arabs, these people aren’t Arabs at all. Perhaps not surprisingly, many of the most dangerous Da’ish fighters are from this group. The Chechens in particular stand out as superb fighters, feared across Syria and Iraq. Indeed, Da’ish’s greatest battlefield commander was a man named Tarkhan Batirashvili who went by the nom de guerre Abu Umar al- Shishani, or “Father of Omar, the Chechen.” If Da’ish had a truly gifted tactical commander, one able to wage maneuver warfare with the skill of Chad’s Hassan Djamous, it was al-Shishani. No other Da’ish commander even came close. None proved themselves able to fight and maneuver the way that he did. Moreover, not only he himself, but all of his key lieutenants were Chechens. When he was finally killed in 2016, his elite command was transferred over to a unit of Uzbeks, and he was succeeded as Da’ish “War Minister” by a Tajik.